Note: Please update firmware if your current one doesn't support this BeagleBone Green HDMI Cape. BeagleBone Green HDMI Cape is a general integrated HDMI connector for expanding your BeagleBone to a rich variety of peripherals such as a computer monitor, a video projector, a digital television, or a digital audio device. This board features a standard HDMI receptacle that can be connected to a monitor with a standard HDMI-to-HDMI cable. All HD signals are supported, and the output resolution is 1280x720. It also can be used to transmit audio information. This product will make your applications based on BeagleBone board more versatile for different occasions. 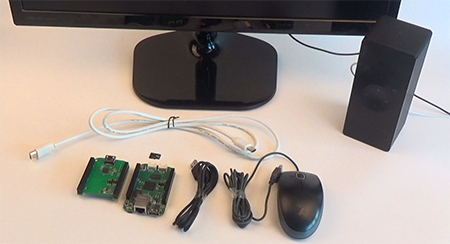 It is a demo which we plug BeagleBone Green HDMI Cape into shield of BeagleBone Green board, and connect to our computer, then we can open Chromium browser to surf internet or play music. Hi there, It depends on whether the touch screen support BeagleBone Green. We do not have this one you mentioned, Sorry, can't help you. Can I use this cape with BeagleBone White version A3? Can I use this HDMI Cape with BeagleBone Green Wireless? Yes, it is compatible. thanks. the above link for firmware download gets a 404 error on dropbox. Is there any other source?